Mexico, although profoundly changed by the arrival of Europeans, has a long agricultural tradition that stretches back into pre-Columbian times. As you might expect, Mexican cuisine therefore combines elements of both the indigenous native American cuisine with European (especially Spanish - Spain ruled the country for 300 years) influences, and uses ingredients from both. Traditional Mexican ingredients include corn, beans and chillies. These items have been part of the Mexican diet for thousands of years. Ingredients introduced by the Spanish include sugar, cheese and livestock. Fruits and vegetables include some that are both native to Mexico, and others that have been introduced: avocado, coconut, papya, pineapple, prickly pear cactus, squash, sweet potatoes and tomatoes. 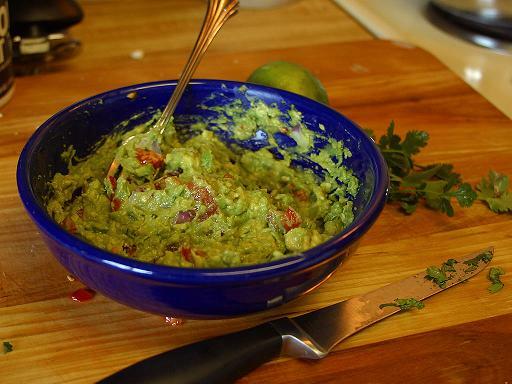 Guacamole - Guacamole is a dip whose principal ingredient is avocado, bout to wich other ingredients such as tomatoes and salt, and sometimes lime juice, onions, and spices, can be added. The recipe is believe to date back to pre-Columbian times. Tortilla - Tortilla is the traditional bread of Mexico. It is a flat unleavened bread made from ground maize (corn) or wheat flour. Some people claim the maize variety is more traditional, but in fact both forms have a very long history. Chili con carne - A spicy meat (beef or pork) stew with chili peppers. This dish has been widely exported and taken up in other countries, especially the United States, and hence there are many variations, either regional or based on personal preference. For example, tomatoes, onions, or kidney beans may added, brown sugar used as condiment, and in some countries (principally the United States, the United Kingdom the Sweden and Japan), it has become common to serve chili con carne over rice. 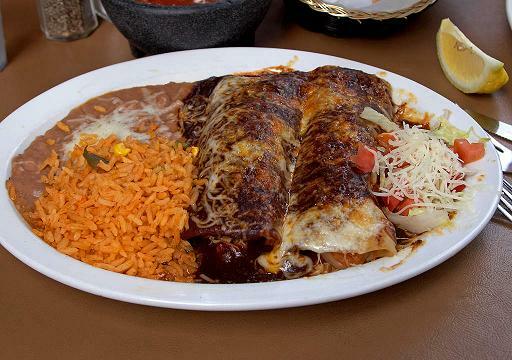 Enchilada - Enchiladas are tortillas that are dipped in oil or lard, then sauce, filled, rolled, placed in a casserole dish and layered with more sauce or other ingredients, and finally baked. Burrito - A tortilla filled with meat, such as beef, pork or chicken. 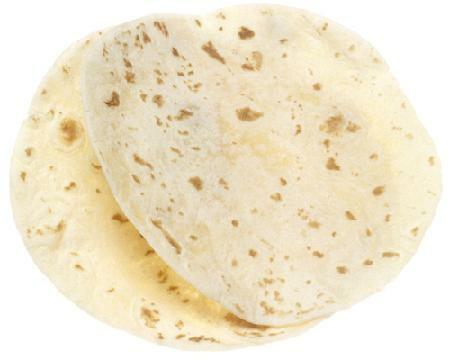 Traditionally, only meat is used for filling, and the tortilla is rolled into a thin tube. In the USA and other countries, it has become common to add other ingredients such as rice, beans, tomatoes, salsa, guacamole, cheese or sour cream. Bring the authentic flavors of Mexico into your kitchen! Prepare a Mexican meal your friends and family will love and ask you to make again and again! Mexico’s rich food history has been acknowledged across a world that now celebrates traditional Mexican culinary practices. Flavor-rich Mexican cuisine is appreciated worldwide for its clever use of chilies, peppers, and beans to create unique textures and flavors. Mexican foods bring real charm to any celebration, casual party, formal get-together or classic weekend dinner. Modern Mexican cuisine represents an amazing combination of culinary craft from Spain and Mexico. The people of Mexico have great passion for their food; they are proud of the culinary customs that guarantee a perfect balance of flavors in all their meals. Mexican foods are full of exotic flavors resulting from their unique preparation techniques. They are usually multilayered—think of tacos, burritos, tortillas, and carnitas—and this means that it takes longer to prepare and arrange the ingredients for some recipes. But in the end, it is well worth your effort to get a perfectly balanced meal with unique flavors. No matter how many times you enjoy Mexican recipes, you will always want to have them again and again. Not everyone is fortunate enough to live in Mexico and enjoy its world-class cuisine firsthand, but you can make it easily in the comfort of your home. Mexican food may seem challenging and complex to prepare at first, but the fact is that once you start making it, achieving an authentic taste will soon become almost effortless. This cookbook delivers a handpicked collection of flavorful Mexican recipes that are easy to prepare at home. Some of these recipes are a little rich—not necessarily the best thing to eat when you’re on a diet—but they are all full of amazing flavors. You’ll get to explore a wide range of Mexican dishes for your various cooking needs, be it breakfast, poultry, meat, seafood, fish, vegetarian mains or desserts. All recipes come with a detailed list of ingredients, cooking and preparation times, number of servings, and easy to follow step-by-step instructions. Let’s get started, so you can experience and cherish amazing Mexican food every day! Scroll back up and click the BUY NOW button at the top right side of this page for an immediate download! Ingredients Go In, the Flavors of Mexico Come Out. It's That Simple. Just because you love eating Mexican food doesn't mean you want to spend hours in the kitchen preparing and cooking ingredients. This slow cooker cookbook brings easy slow cooker meals to your table with the flavors of Mexico--with minimal effort on your part. Whether you crave beloved Mexican classics or less-traditional restaurant favorites, you'll find everything from cochinita pibil (slow-roasted pork) to chile and cheese dip in Marye Audet'sMexican Slow Cooker Cookbook. The hearty soups and stews, enchilada- and tamale-inspired casseroles, and tender meat dishes make for convenient and satisfying everyday dinners. When you want flavorful Mexican dishes that take less than 20 minutes of prep, open this Mexican cookbook and go about your day. Dinner will be waiting for you. Get your copy of the best and most unique Mexican recipes from Chef Maggie Chow! Come take a journey with me into the delights of easy cooking. The point of this cookbook and all my cookbooks is to exemplify the effortless nature of cooking simply. In this book we focus on Mexican Cuisine. The Easy Mexican Cookbook is a complete set of simple but very unique Mexican recipes. You will find that even though the tacos and meals are simple, the tastes are quite amazing. So will you join me in an adventure of simple cooking? Pick up this cookbook today and get ready to make some interesting and great tasting Mexican dishes! The Beloved Classic back in print!